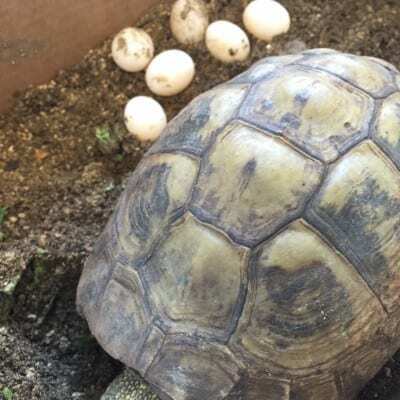 We have awarded this month’s Pet Of The Month to Henrietta the Hermann Tortoise. Henrietta’s owners noticed something was wrong when Henrietta stopped eating. She came in to see us and we suspected Henrietta was suffering from Post Ovulationary Egg Statis (POES). 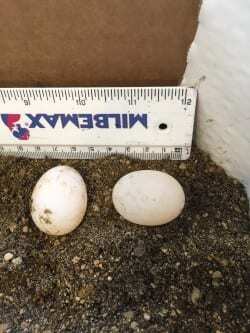 This is also known as egg binding and can be a common problem in pet tortoises. A radiograph of Henrietta confirmed our suspicion. 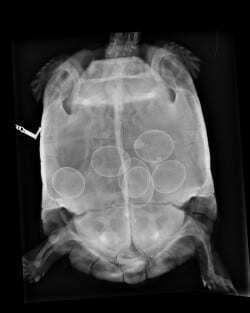 Six calcified eggs could be seen inside Henrietta (see picture). Henrietta was given a bath to help rehydrate her and then settled into a nice warm bed of soil and sand, ready to make her nest. The eggs were measured on the radiograph to make sure they could come out naturally. Henrietta was then given some medicine to help her pas the eggs. A few hours later all six eggs were in the next and Henrietta was feeling much better. She went home that evening and her owners report she has made a full recovery and is back to her usual self!